Like many others in the family Cerambycidae, R. funebris has strikingly colored wing covers (elytra). The elytra are dark with three white bands. The thorax (pronotum) is white with a large black spot. 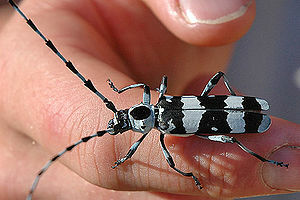 The alder borer's antennae are banded white and black. The males antennae are longer than his body, but the female's are shorter. 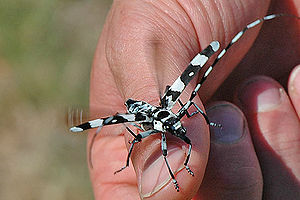 Long and narrow, the body of R. funebris may grow to be 38mm. Rosalia funebris in the second before flight. Located along western North America, Alaska through California, and in New Mexico, the banded alder borer may be found in the spring and summer on the bark of alder trees. The exact reason (pheromone?) is unknown, but R. funebris is drawn to recently painted buildings and may be found, in multitudes, resting on the paint. The adult wood-boring beetles lay their eggs in a crevice of the bark on hardwood trees such as alder and California laurel/Oregon myrtle . From there the larvae bore into the wood. Unlike the oval (in cross-section) tunnels of the Buprestidae larva, larval Cerambycidae tunnels are circular (in cross-section) and will generally go straight for short distances between turns. Most mature Cermabycidae feed on flowers. ↑ Triplethorn, C.A. and Johnson, N.F. (2004). Borror and DeLong's Introduction to the Study of Insects. Thomson Learning. This page was last modified on 17 May 2010, at 21:57.